Newcomer Family Obituaries - Harold Morgan Sr. 1926 - 2018 - Newcomer Cremations, Funerals & Receptions. Harold, age 92, passed away on Thursday, November 22, 2018. He was born in Huntington, West Virginia on January 29, 1926 to the late Rush and Ella Rose Morgan. 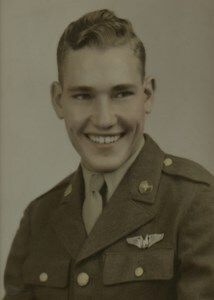 Harold was a US Army Air Corps. veteran, serving during WWII. Preceded in death by his wife, Alah; his son, Larry; and his brother, Norman. Survived by his son, Ed (Linda) Morgan; his sister, Jo Ann (Earl) Ray; his loving companion, Helen; his 8 grandchildren; 11 great-grandchildren and 6 great-great- grandchildren. Visitation will be held on Tuesday, November 27, 2018 from 10am until the time of service at 12noon at Newcomer- West Side Chapel, 3300 Parkcrest Ln. Cinti., 45211. In lieu of flowers, donations to, Disabled American Veterans, 3725 Alexandria Pike, Cold Springs, Ky. 41076. To share a memory of Harold or leave a special message for his family, please click the Share Memories button above. Add your memories to the guest book of Harold Morgan Sr..
We are all deeply saddened to learn of Uncle Harold’s recent passing. At the age of 87 he drove himself to Louisa KY to pay his respects to our mom at her passing. A true gentleman with a great laugh. We are blessed to have known him and thankful Aunt Alan made him a part of our family. Rest In Peace and thank you for your service to our country Harold.